We had been trying to organize this trip for months. Providentially, we found out that urgent help was needed in Barraganete, a community pertaining to Pichincha Parish in Manabí. The Carmelite Fathers of Mary Immaculate are there. 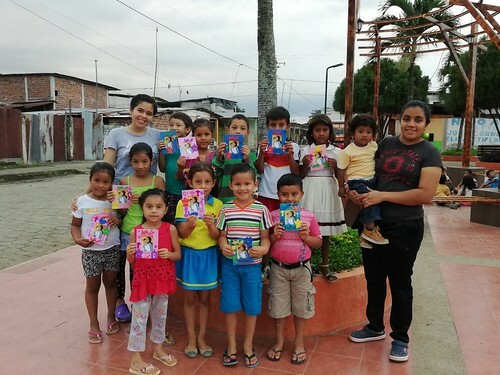 Barraganete is one of the communities that has a chapel and catechetical instruction, but it is surrounded by other communities that are in need of spiritual attention. The three priests that live there have about 90 communities that they are in charge of, of which they are unable to attend to as frequently as they would like. This is why they asked for help from missionary teams. About a month beforehand, we contacted them for the first time during a visit to Pichincha Parish. We got to work immediately to organize it. We left Playa Prieta on December 26th and made our way to Pichincha, where we took a flatboat to cross the marsh. Once we arrived at the other side, we went to Barraganete by car where we stayed for four days. We dedicated the first afternoon to missionary work in Barraganete and invited people to pray the Rosary with us that evening. The next two mornings, we split up into groups in order to reach the communities that were farther away yet still had travelable roads. They had not been greatly affected by the rains. It is a very poor, rural area. The people there have few opportunities to study. In general, there is very little hope for improvement. As regards to the Faith, we found ourselves before very diverse realities. There were people who are baptized and know their basic prayers, even though they never received catechism. However, at other houses, they did not know the Our Father or even who Jesus is. We had a lot of work ahead of us. At the houses we visited, we brought the joy of the Savior’s birth. Like the angels announced to the shepherds the birth of the Messiah, the Savior, we also brought the Good News to those homes. We brought small statues of Baby Jesus to give to the families. It was truly beautiful to see each person’s reaction when he or she received that little—big for them—gift in his or her hands. The elderly became like little children: they gazed at Baby Jesus and cuddled Him as if it were really the Child Jesus. Meanwhile, we sang Christmas carols. In the afternoon, we returned to Barraganete to do activities with the kids. There were over 120 of them. We had catechism lessons, crafts, and played games with them. The last night of the mission, the children did not want to go home. They thanked us and begged us to stay. The evenings with them had been so special and joyful. For those of us who carried out the mission work, it was a grace to go there the week of Christmas. We were eyewitnesses of those people’s suffering and God’s love for them. We are praying for them so that the Lord may manifest his love and nearness to them. We realized that it is a gift to know God and have so many opportunities to hear about Him, go to Mass, pray in His Presence, have catechism, etc. We were very privileged this Christmas. Thanks be to God!